Neither the youth vote nor the independent vote were decisive in Sanders' Oklahoma win. 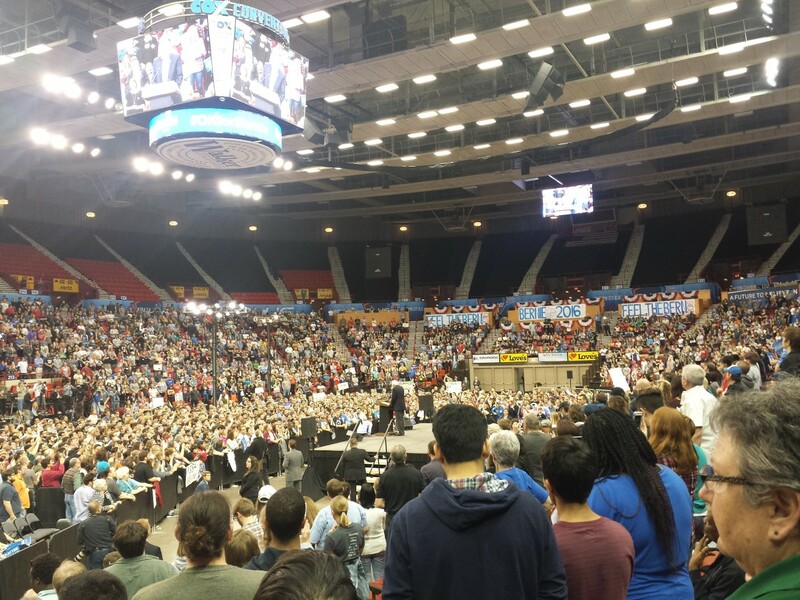 Presidential candidate Bernie Sanders speaks to an Oklahoma City crowd at the Cox Center. Neither the youth vote nor the independent vote were decisive in Sanders’ Oklahoma win. Two myths dog the state’s Democratic primary election in which Bernie Sanders dominated on March 1 — and they’re wrong, according to one analyst. Bill Shapard of SoonerPoll said Oklahoma Democrats have been criticized for opening their primary to independents for the first time in state history. But Shapard said critics erroneously attributed Hillary Clinton’s loss to that decision. Sanders received 174,054 votes to Clinton’s 139,338. “I think the people at the Democrat party are wringing their hands, thinking, ‘We allowed independents to vote and our presumptive nominee, Hillary Clinton, didn’t win Oklahoma.’ … These numbers show that did not happen,” Shapard said. Shapard said SoonerPoll’s analysis found that nearly 90 percent of registered Democrats got a Democrat ballot for president; others chose not to vote in the presidential races. Only 10.3 percent of independents got a Democratic ballot for president. The other myth, Shapard said, is that the election swung for Sanders due to a large turnout in the youth vote. It wasn’t so big after all. Shapard said that 121,005 voters ages 18 to 34, or about 15 percent of all voters, showed up at the polls. In the primary for Democratic and independent voters, 17 percent of voters were age 18 to 34. More than 56 percent of voters were age 55 or over. The youth vote wouldn’t have swayed the vote for Sanders over Clinton, he said. In general, 54 percent of all voters were women; 58 percent were Republicans, 38 percent were Democrats and 4 percent were independents.